As anyone who knows me well in real life can tell you, I adore milk. I guzzle it like it's going out of style. Our household can sometimes go through a gallon in three days, and personally, I used to go through a gallon in two days. While looking for things to do with N last autumn, I found a little farm near us called Merrymead. Recently, while visiting the farm, I picked up a gallon of their milk. Folks, that was the best milk I've ever had, hands down. It was perfect and delicious and I now make visits to their farm solely to get this milk. The best part of the visits is that N loves to go there too! 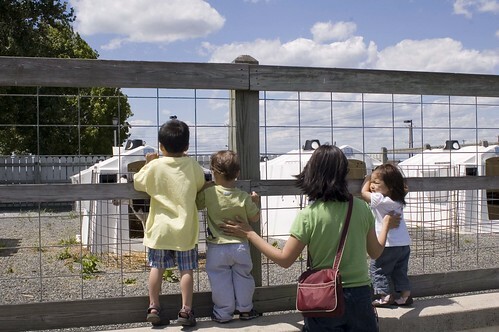 They've got a ton of animals for children to see, including N's favorites: cows. If you don't love cows, they also have a hog, ducks, rabbits, goats, sheep, a donkey, and some peacocks. They have fantastic ice cream to snack on, and they sell freshly ground peanut butter and local jams and butchered meat. I like to take a trip up there with N, view the animals, wash our hands at the children height sinks, snack on a little ice cream, and leave with some milk and whatever other little items catch my fancy that day. 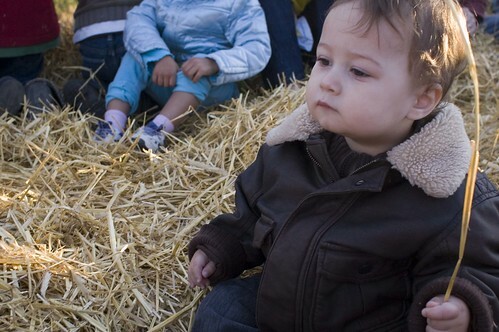 While that's not bad, the place gets even more awesome every autumn with hayrides, gigantic corn mazes (and tiny ones too for the littles), and delightful autumnal treats. I'm so happy that we discovered this place, and I'm sure we'll be visiting pretty regularly for as long as we live at this house! heh. I love this picture.